On January 11, Russell Shorto will be at the John Jay Homestead State Historic Site in Katonah, New York, to talk about his new book Revolution Song: A Story of American Freedom (New York: W.W. Norton, 2018). Shorto is the author of several books, perhaps the best known being The Island at the Center of the World: The Epic Story of Dutch Manhattan and the Forgotten Colony That Shaped America (New York: Vintage Books, 2005). In his new book Shorto has taken a different approach to writing about the founding of our nation. This “change of focus” involves “weaving six different lives into one story” creating what he calls “a narrative song.” The characters are a Seneca warrior named Cornplanter; England’s Secretary of State for the American Department, Lord George Germain; George Washington; Venture Smith, an American slave who bought his freedom; Margaret Moncrieffe Coghlan, the daughter of a British military officer, with connections on both sides of the Atlantic; and Abraham Yates, Jr. of Albany, New York, a self-made man whose views and writings reflected the tradesman’s perspective and a distrust of elites on both sides, British and American. Shorto’s research is prodigious; he has drawn on primary source material for all of his characters—letters, diaries, account books, scribbled orders—managing to orchestrate the lot into a cohesive narrative. The lecture on January 11th will take place in the Iselin Wing at John Jay Homestead. Registration and refreshments begin at 6:30 pm; the lecture begins at 7 pm. $25; $20 for members. Limited free seating is available for students. “A gifted storyteller” David McCullough called THOMAS FLEMING who died on July 23 at the age of 90. 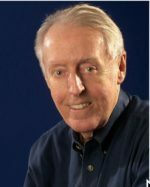 McCullough added: “He was a man of natural ease with people and with stories.” A prolific novelist and historian, Fleming’s favorite subject was the American Revolution, the struggle he considered essential to understanding the history that followed. I couldn’t agree more. Two Nerdy History Girls is a blog I subscribe to. The bloggers are two women, Loretta Chase and Susan Holloway Scott; the former writes historical romances and the latter historical novels and, under the pen name Isabella Bradford, historical romances. They both pride themselves on doing extensive background research for their books. Their blog posts often feature information they have come by as a result and are always fun to read. A bonus: every Sunday they present a roundup of other blog posts they find interesting. Susan has a new book coming out in September, a historical novel called I, Eliza Hamilton. I suspect she got her inspiration from the highly successful Broadway play Hamilton. Eliza Schuyler was the wife of Alexander Hamilton. I look forward to seeing what Susan does with her story. For my posts on Eliza, her sister-in-law-Angelica Schuyler Church, and Hamilton’s mistress Maria Reynolds see here, here, here, and here. In the news recently is the recall by Scholastic Publishers of A Birthday Cake for George Washington by author Ramin Ganeshram and illustrator Vanessa Brantley-Newton which was released on January 5. The story is about Washington’s cook, a slave named Hercules, and his daughter Delia who bake the cake of the title. The book for young readers has been criticized because it depicts slavery in the Washington household as rather benign. Hercules was an accomplished chef who served the president in Philadelphia and was accorded privileges denied other enslaved workers. A bit of a dandy, he ran a tight ship lording it over his underlings in the kitchen and was able to accrue a considerable amount of money by selling leftovers from the presidential table. Washington regularly rotated his slaves back to Mount Vernon from Philadelphia because of a Pennsylvania law that allowed them their freedom after six months residence. When Hercules was returned to Mount Vernon early in 1797 and was assigned duties as a laborer, which he must have considered beneath him, he ran away. George Washington was angered and mystified by his action just as he and Martha never could understand why Oney Judge, a slave who was one of Martha’s personal maids, also ran away in 1796 when she was in Philadelphia. In both cases Washington attempted to recover the slaves, but his efforts failed. See recent posts about Oney here, here, and here. See the article on Hercules in George Washington’s Mount Vernon, also J.L. Bell’s blog post on the subject.